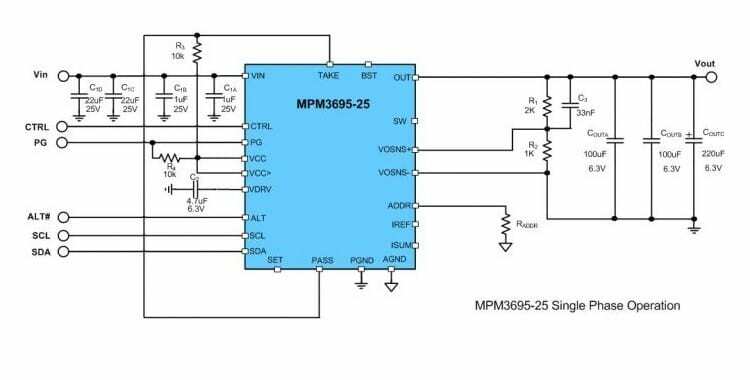 Monolithic Power Systems (MPS) has added the MPM3695-25, a scalable, 25A, fully-integrated power module with PMBus interface. It offers a full power solution that achieves up to 25A of output current with excellent load and line regulation over a wide input supply range. Applications for the MPM3695-25 are expected to include telecom and networking Systems, industrial equipment, servers and computing, and FPGAs/ASIC artificial intelligence and data mining. MPS has also announced the EVM3695-25-RF-03B evaluation board; a high efficiency, high power density 40A synchronous step-down power converter, featuring two MPM3696-25 in parallel. The input range of the evaluation board is from 4.5V to 16V. Providing the external 3.3V supply to VCC pin can extend the operation range from 3V to 16V. The output voltage is adjustable from 0.5V to 5.5V, with default at 1.8V. The EVM3695-25-RF-03B can output up to 40A continuously/50A peak load current. The MPM3695-25 operates at a high efficiency over a wide output current load range. The MPM3695-25 can be paralleled with any phase number to output up to 250A of current. The MPM3695-25 adopts MPS’s proprietary multi-phase constant-on-time (MCOT) control, which provides fast transient response and eases loop stabilization. The MPM3695-25 also provides redundancy to protect the load. 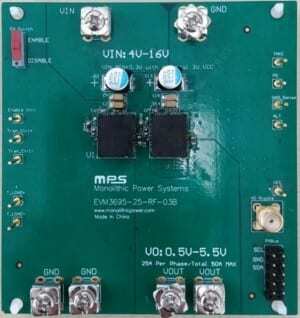 The PMBus interface provides module configurations and the monitoring of key parameters. Fully integrated protection features include over-current protection (OCP), over-voltage protection (OVP), under-voltage protection (UVP), and over-temperature protection (OTP). The MPM3695-25 requires a minimal number of readily available, standard, external components and is available in a QFN-55 (10mmx12mmx4mm) package.